As a child, I loved the little details of the landscape, patterns made by the lengthening shadows in the woods, the ripples on a pond, or the intricate swirls made when water freezes in a brook or puddle. Long before I knew anything about art, I was viewing the world in terms of pattern, movement and simple intimate compositions. I was noticing abstract design elements, not just objects. I had landed upon a way of looking at the world that would stay with me and inform my work years later. 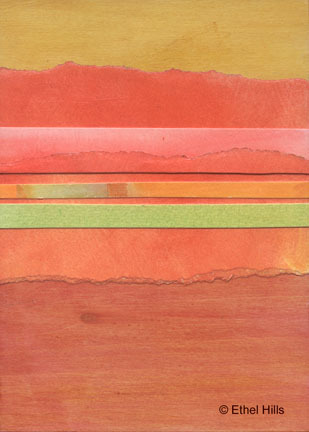 As my work moved further away from realism, my use of color became stronger and bolder. I developed a passion for warm intense colors, colors that brought me joy; colors that made me feel good. I believe we are more connected to land and place than we realize. We carry with us the memory of places we have known intimately, places where we felt safe, places where we felt joy or peace, all those special places that continue to elicit an emotional response many years later. This connection between landscape, emotion, and memory is the basis for my paintings. The small scale mixed media paintings that I now create reflect my passion for color, my semi-abstract take on the world, and my use of landscape imagery. These elements contribute to my goal of producing paintings that remind the viewer of their own connections, their own memories, their own special places.